I've finished the body of my Lightweight Pullover and I've started the first sleeve. Thank goodness I kept good notes since I adjusted the stitch count on the sleeves because I wanted a slimmer sleeve than the pattern called for, but I had completely forgotten doing that. When I went to pick up stitches, I obviously didn't have as many stitches as called for and I thought at first I'd messed up. Once I saw my note, I sort of remembered changing things. Thank you KnitCompanion for having a way to leave notes for myself since I apparently have the memory of a squirrel. The kind of squirrel that fell out of the tree in the middle of a hail storm and landed on its head. That squirrel. 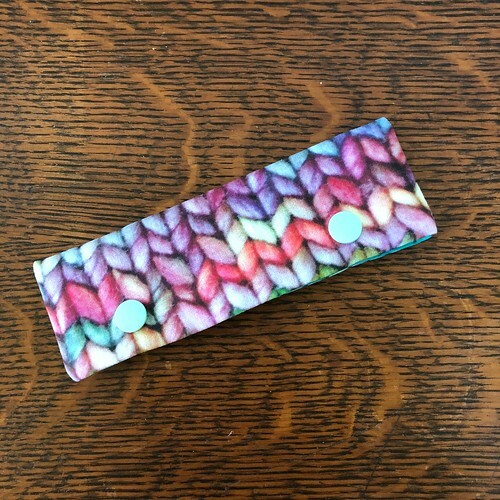 I finished my (first) Find Your Fade! It will not be my last. I didn't really block it, I just spread it out over towels, patted it into shape and sprayed it with the water bottle. It is huge. If I had blocked it hard and really opened up the lace it would happily cover a small family of eight and keep them nice and cozy this winter. This was so much fun to knit! 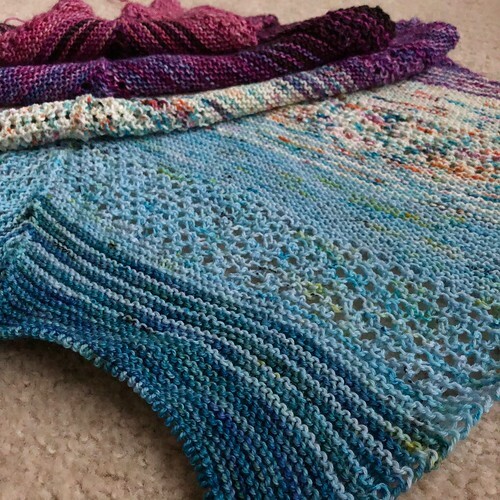 Seven colors in one project and easy, TV friendly knitting made this fun. 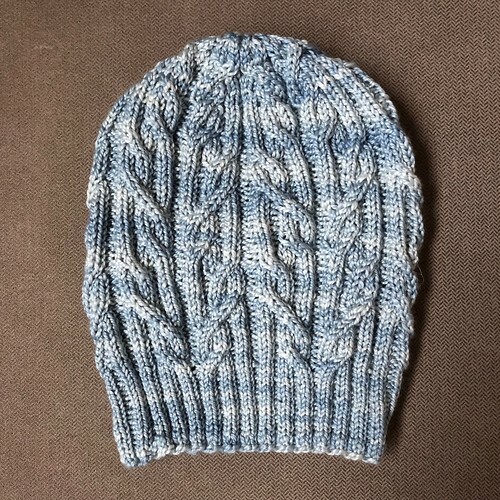 I was able to do this one completely from stash, but it didn't use any of the yarns completely. I might use the leftovers and make a faded Hitchhiker. I could also use some of the yarns to make footie socks (you haven't seen any of those around here in a while, have you?) I haven't decided what to do just yet, and I probably won't decide for a while. I'm just going to snuggle into my new shawl! I want to do another one in greens. Maybe next year? I've been knitting on my Lightweight Pullover lately. 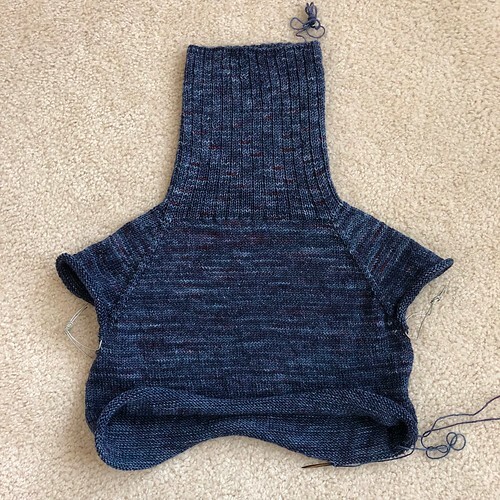 I think I'm about to start the lower ribbing, but I'm going to try it on today and double check that. There's nothing at all complicated about this pullover, so it's been perfect to knit on during the post turkey coma and the weekend after it. OK, I'm off to find some caffeine. If stupid rhymes are amusing me, I definitely need caffeine. I made myself a Moneta dress for Thanksgiving! 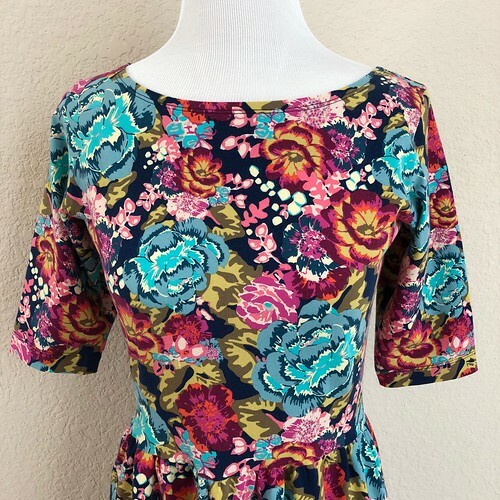 Being the second Moneta I've made, this one went together even faster than the first, and the first was pretty fast. I used the 3/4 length sleeve again because this is November and even if we've got the A/C on here, I feel better about myself as a person if I'm dressed season appropriately. It's supposed to be in the high 60's on Thanksgiving here so I think the dress will be perfect! 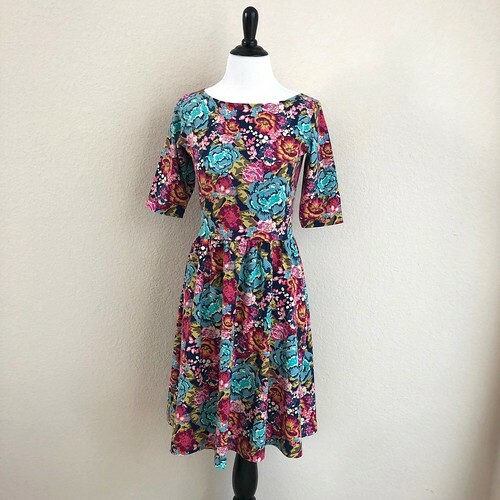 I used another Art Gallery Fabrics Knit from Hawthorne Threads to make the dress. I know I've said it before, but I love their knits! As long as they keep coming out with such pretty prints, I'll keep sewing with them. I hope you all have a great Thanksgiving if you're celebrating this week! 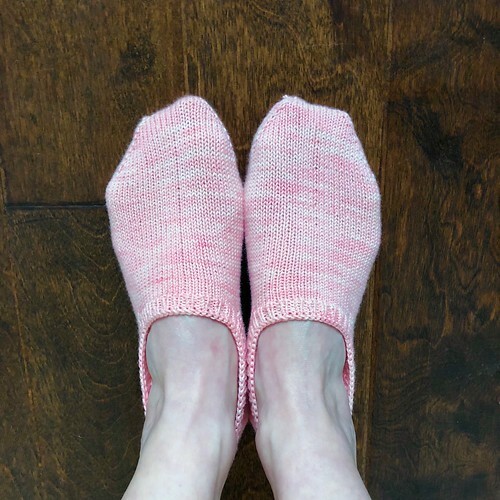 I have finished the pair of Pink Footie socks! There's not much to say about these since at this point you've seen the pattern so many times before. The yarn is Blue Moon Fiber Arts Socks That Rock Lightweight in Rosebud. They're not the most exciting project, but they do get worn! 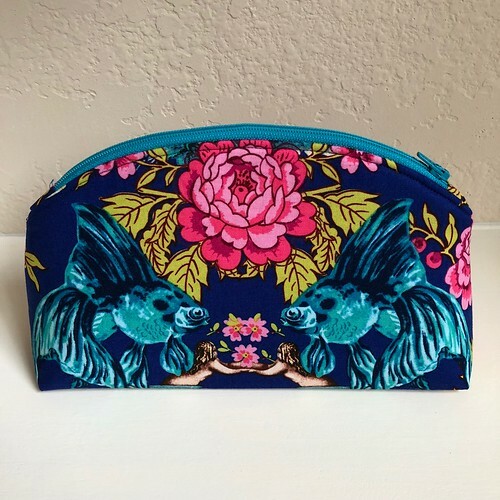 When I shop for a handbag, like all women, there are a few things I'm always looking for. I've found that bags that have lots of slip pockets and zipper pockets and dividers don't actually work very well for me - too many places to put things means I can't actually find anything when I need it, and usually the size of the slip pockets/zipper pockets/dividers doesn't quite work with my stuff. I've found that having a few pockets works better for me than tons of pockets. Now I still have stuff, and I don't really want all of it randomly floating around in my bag either, but a zipper pouch, separate from the purse (so I can pull it out and dig around in it) will corral all my stuff. Over the weekend I made a new pouch for my handbag. 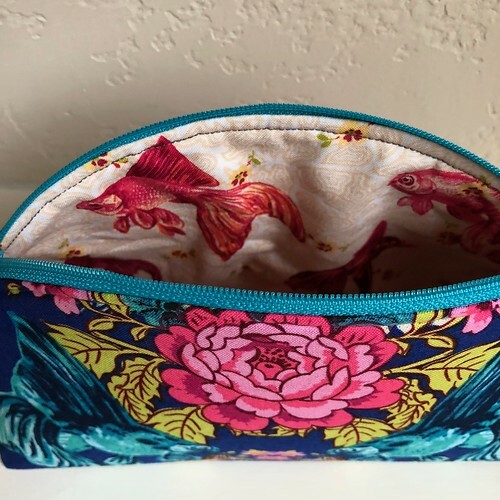 This is the Bellevue Pouch which is part of the Minikins set from Sew Sweetness. This is the small size and it's actually plenty big for what I keep in my purse. I used Free Spirit's Tokyo Milk Neptune and the Mermaid fabrics for the outside and the lining. I fussy cut the outside pieces (I made them different because, why not?) and just followed the directions as they were written to sew the bag together. It was a super fast project and in a little over an hour, I had a new pouch! And here's the lining - goldfish! The pattern is only available as part of the Minikins collection, but I think it's a great collection. I will definitely be making more of these! 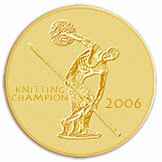 Last Thursday ESK announced a flash challenge for knitting hats. Fortunately, I had some yarn all picked out and wound and ready to go, so I cast on Thursday afternoon. 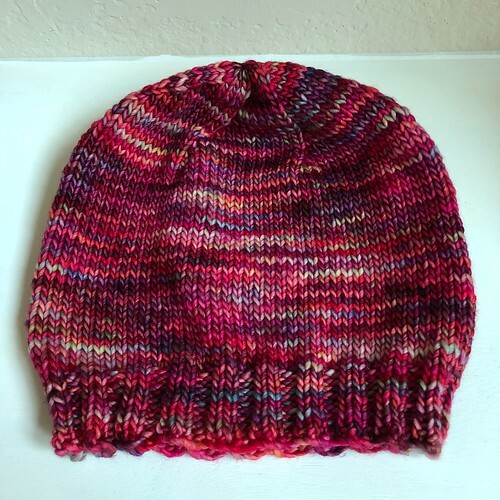 I finished the hat Saturday morning before lunch and here it is! It's just a basic hat with some slouch to it. 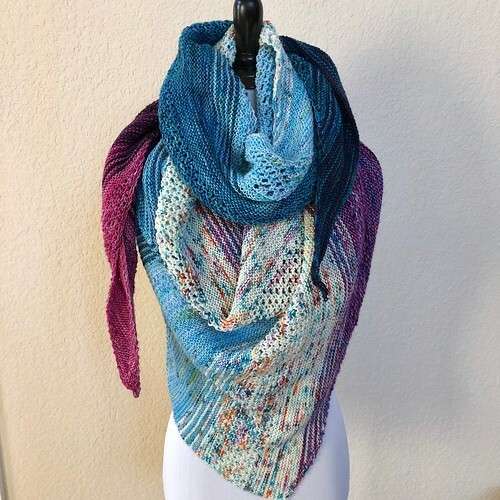 I knit it in Malabrigo Mecha in Aniversario (love this color) and it was so much fun watching the colors show up and blend into the knitted fabric. Honestly, I kind of want a sweater out of this! I'm not sure how practical that is for Texas, even North Texas, but I think this would be a great oversized pullover paired with jeans! Also, it would only take about ten minutes to knit a sweater in bulky yarn (OK, maybe 15 minutes). 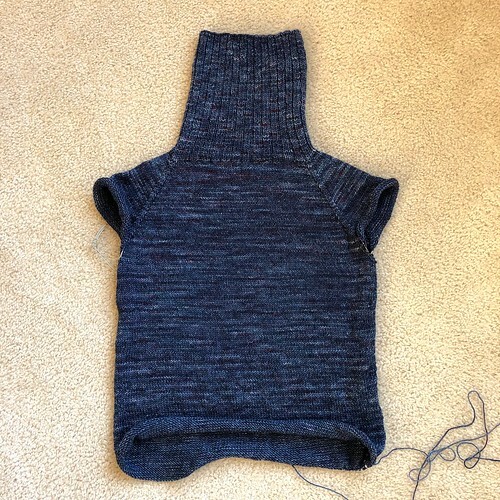 I'm working along on my pullover body. 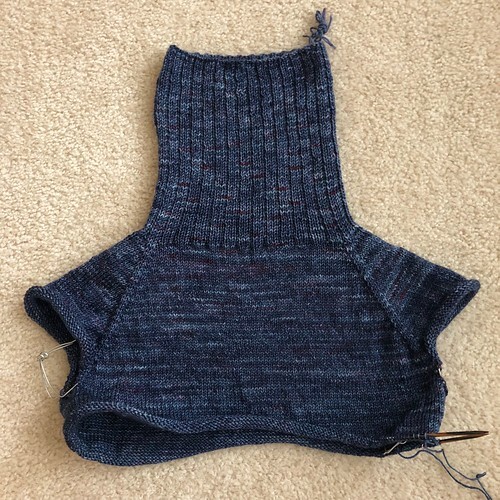 Progress is slow but steady on this sweater. The gauge is tight enough that this shouldn't stretch like crazy (which could be a problem in this silky yarn) while being just loose enough to remain soft. The tighter gauge means it takes a bit longer to knit. It couldn't be simpler though and the yarn feels wonderful to work with, so I just sit down with something on the Netflix and knit. I'll be knitting this weekend and trying to stay warm. Fall has finally arrived here and it's a little chilly! Have a great weekend! 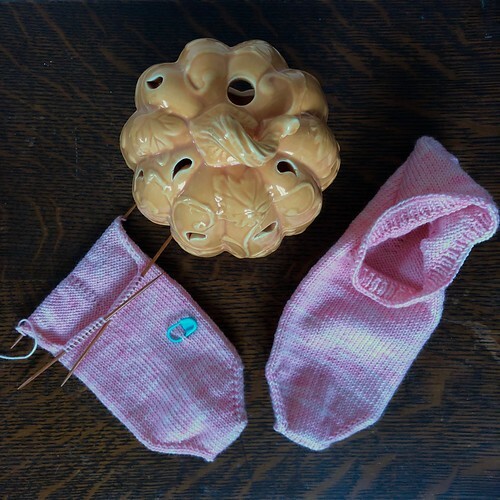 I've finished my first pink footie sock and I'm ready to start the heel turn for the second one. 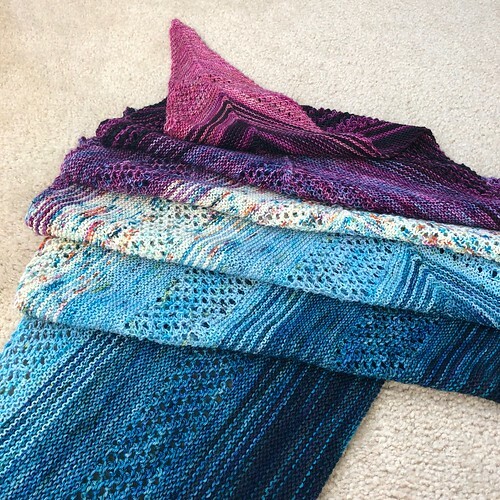 I should have these both finished over the weekend, which is good because I realized that I need to do a little Christmas knitting (and sewing) and apparently Christmas is coming. I've maybe been ignoring that fact for a little while now. I've begun Color F (AKA Dream in Color Smooshy With Cashmere in Sleeping Under the Stars) which is the second to last color in my Find Your Fade! The blues are getting darker! This whole project is already big and squishy, but I've got a little bit more to go. 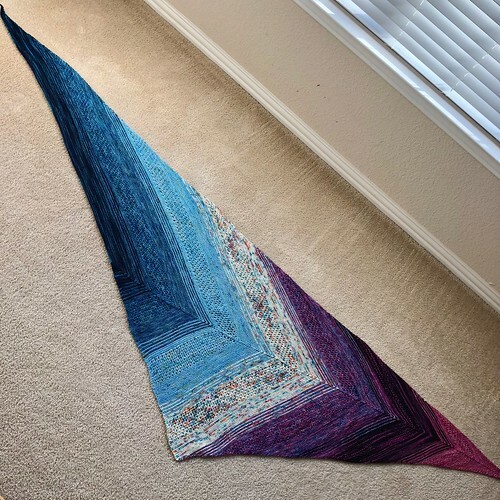 I had to fold it to get all six of the colors so far into a single picture, but I know big and squishy and colorful will be great to wrap around (and around) my neck on a cold day. I'm still working along on my Lightweight Pullover. I'm about to start the shaping in the body of this sweater. Now that I'm back on track with the pattern, I don't have to do as much thinking while I knit. I can just follow the pattern. I'll have to do things like check length of the body and sleeves, and if I do longer cuffs with thumb holes, I'll have to figure those out, but for right now, I can just knit. I made a Double Pointed Needle Keeper! 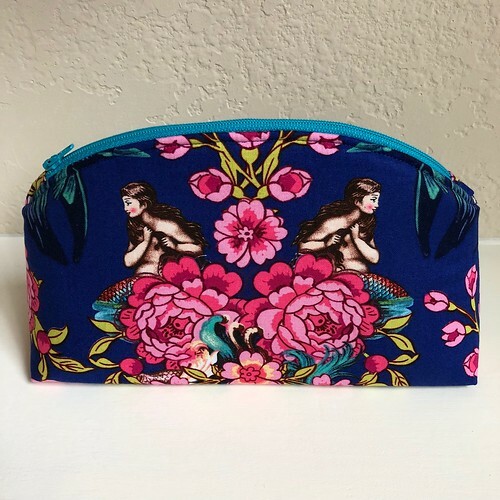 I've been thinking about making one of these for a while, both to protect my needles in the project bag and to protect my project bag from my needles. It worked up super quickly and would make a fun little gift for a knitting friend. I used the tutorial I found here. I made mine a little shorter because I usually use five inch DPN's for socks. My main fabric is from Spoonflower (they've got a BOGO sale on Fat Quarters right now and a single Fat Quarter will give you several of these), and I used some batik scraps from my stash for the lining. I had the KAM snaps already but this was the first time I've used them. They were super easy to use and I like the way they look on the finished needle keeper. Here's an action shot with the Rosebud footie in progress in it. 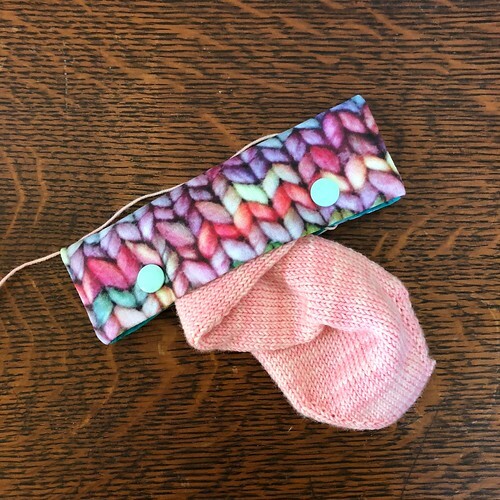 Footie socks are kind of a funny shape, but the needle keeper is still doing its job - keeping the needles tucked in and safe! 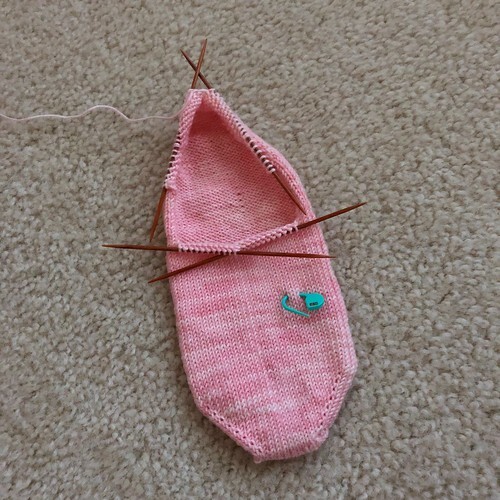 I'm almost through with the heel turn short rows for my Rosebud footie sock! Then I've just got some shaping short rows and ribbing and the first sock is finished. 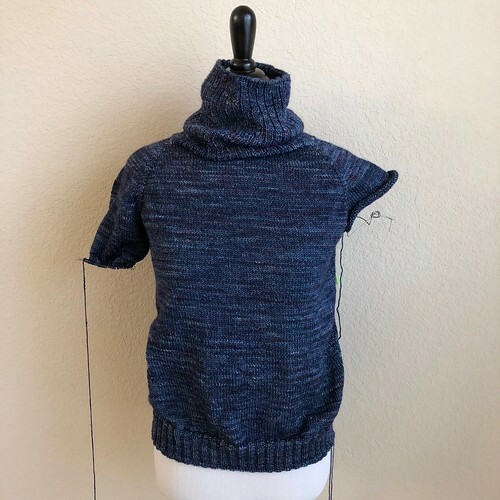 This project hasn't been getting much attention because both the Find Your Fade and the Lightweight Pullover I'm currently working on are also brainless knitting. The big difference is the sock is portable. I haven't needed a portable project lately, so the sock has been neglected. Poor sock! It's not you, it's me!